At these top London restaurants vegetables, pulses and seeds are turned into meals so memorable that even confirmed carnivores won't miss the meat. Dish it up yourself and pay by weight at Ethos which caters for vegetarians and vegans alike. Ethos serves a global menu including unique, homemade BBQ 'ribs' and Hyderabadi Scotch eggs that should appeal to all, even the meat eaters among you. 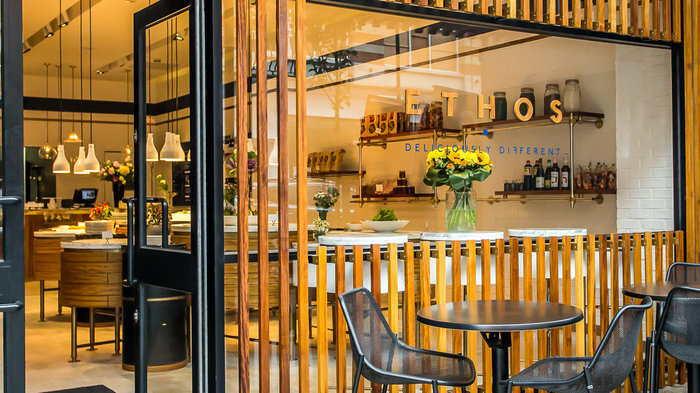 Catering for vegans and vegetarians, Ethos is a meat-free restaurant where you pay-by-weight. Presenting dishes from around the world, they serve everything from your morning coffee to seasonal salads for lunch, through to spicy curries, hearty Tuscan stews and creative cocktails for post-work dinner and drinks. Other dishes include Thai corn fritters, Colombian crema de Aguacata soup, and Lebanese green bean and tomato salad, loubieh - see, we told you it was a global menu. If you've still got room for pudding, try indulgent cake balls, a lemon and raspberry posset or gevulde speculaas biscuits - a Dutch-inspired dessert. On the drinks menu are juices, cocktails and wines, coffees and speciality teas. Contemporary interiors are decked out in silver birch trees and neutral whites and blues with gold accents, airily lit through floor-to-ceiling windows. Ideal for allergy sufferers and those who eschew gluten in all its guises, Ethos offers a wide choice of clearly labeled gluten free, dairy free and vegan options. Raymond Blanc's protege Bruno Loubet is the chef and patron behind the Grain Store. The tarted-up Granary Square in King's Cross is home to the Grain Store, a new bistro from Raymond Blanc's favourite protege Bruno Loubet, who has made a name for himself with his unpretentious French provincial cooking. This is the second London restaurant from Loubet who already runs his own name restaurant at the stylish Zetter Hotel in Clerkenwell but the new venture is a more informal affair than Bistrot Bruno Loubet. The King's Cross area next to the Regent's Canal underwent a complete redevelopment with the arrival of St Martin's College of Art & Design and the Grain Store isn't the only high profile restaurant to open on Granary Square, it joins the very popular Caravan. Designed by Russell Sage - who was also behind Bistro Bruno Loubet and the Zetter Townhouse - the restaurant seats 80, with 40 seats in the bar and a massive 100 seats available outside overlooking Granary Square. Serving up meat-free dishes since 1966 and still innovating. This is the oldest vegetarian restaurant in the UK, serving up meat-free dishes since 1966, but they have managed to keep up with the times very successfully. The decor is white-walled rustic chic, with plenty of candles in the evening. The menu has a variety that many vegetarian restaurants struggle to achieve, with an emphasis on simple, strong flavours. Beautiful presentation and great sauces liven up their sturdy main dishes which include thai green curry, a lightly spiced coconut delight with cashew rice, and the best veggie bangers and mash with organic fennel and pumpkin seed sausages on a bed of parsnip and carrot mash served with cavalo nero on a red wine, leek and thyme jus. Manna from heaven. Established in 1988, Mildred's is a Soho institution that has gone from strength to strength. Established in 1988, Mildred's is a Soho institution that has gone from strength to strength, worth a visit whether you're vegetarian or not. They have a rare ability to translate the latest culinary trends into inexpensive, unusual, meat-free dishes and service is brisk as well as friendly. To give you a taste of a typical menu, you might find a fine mixed mushroom pie, along with great Vietnamese soups, Japanese gyoza and a Moroccan chickpea tagine. All dishes are made using organic ingredients where possible, cooked to a high standard and come quickly. Tables are in high demand in the narrow, bustling dining room which is frequently filled with noisy chatter; there's often a queue but people watching at the bar while you wait makes the time pass relatively painlessly. All of this makes Mildred's one of our favourite places to lunch in Soho. Raw food ensures ingredients are as close to nature as possible. Plant based restaurant Nama in Notting Hill believes in harnessing the power of natural food and serves balanced and nourishing dishes, all of which are raw to ensure they are as close to nature intended as possible. The vegan, organic and unprocessed menu features breakfast dishes such as walnut pancakes with banana ice cream and zucchini crepes with tomato relish, spinach and caramelised onions. Mains include a vegetarian sushi platter, Thai coconut curry and pizza, with a courgette and walnut base topped with nut and seed cheese and pomodoro sauce. And, proving that a healthy lifestyle doesn't have to be boring, there's even a selection of cheesecakes and tarts as well as wine, prosecco and organic lager. Combining a restaurant, all-day deli and raw food workshops on the lower ground floor, Nama is a one-stop shop for all discerning vegetarians. Winner of the Best Vegan Menu at the PETA UK Vegan Food Awards. Located within La Suite West, a minimalist hotel created by renowned interior designer Anouska Hempel, RAW is a restaurant which offers a meat free menu and alcohol free "mocktails" - try a virgin strawberry daiquiri if you want a clear head after a night out. Winner of the Best Vegan Menu at the PETA UK Vegan Food Awards in 2015, head chef Nik Heartland has carefully designed the menu to make best use of what nature has to offer, with options such as Mexican tortillas, BBQ Korean fried tempeh burgers and tiramisu with almond biscotti to finish with something sweet. With a capacity of 50 seats RAW is open to hotel guests and the public alike for all-day dining including a vegan alternative to the quintessentially British tradition of afternoon tea. The mid afternoon meal is a combination of finger sandwiches, home-made scones served with coconut cream and fresh strawberries, followed by a selection of home-made pastries. Even if you are not vegetarian The Gate is an excellent choice, with a welcoming, intimate atmosphere and consistently delicious fare. One of the best vegetarian restaurants in London, when the original Hammersmith branch closed for refurbishment in 2012 The Gate opened a new restaurant at 370 St John Street, in Islington - see our separate listing for The Gate Vegetarian Restaurant. But in 2013 the long wait for the original Hammersmith venue to re-open was over. Adrian and Michael Daniel revived this wonderful vegetarian and vegan restaurant hidden behind a superbly romantic courtyard which has put them at the helm of London's most successful vegetarian restaurant since December 1989. The food is sublime, even non-vegetarians agree, and the wine list includes vegan options. Tempting dishes from an ever-changing menu include artichoke gallettes, a potato, celeriac and truffle rosti, butternut tortellini and aubergine teryaki. Even if you are not vegetarian this is an excellent choice, with a welcoming, intimate atmosphere and consistently delicious fare at outrageously affordable prices. Adrian and Michael Daniel, the Indo-Iraqi brothers running The Gate in Hammersmith, have a second venture in Islington. Gwyneth Paltrow, Madonna and Stella McCartney have all eaten at the original Gate Vegetarian Restaurant in Hammersmith and now Adrian and Michael Daniel, the Indo-Iraqi brothers who have been running The Gate since December 1989, have set up a second venture in Islington. Just opposite Sadler's Wells Theatre and around the corner from Upper Street, The Gate in Islington offers the same fare as the original - food that takes 'vegetarian' to a whole new level, way above and beyond nut loaf. They forage for food on Hampstead Heath and take in-season ingredients (June brings a plethora of broad beans, peas, beetroot, gooseberries, raspberries, strawberries and wild sorrel) to create surprising and intriguing flavour combinations. Something as simple as corn cake can be exotic when the corn and polenta are pan-fried and then seasoned with chilli, coriander and thyme, and served with roasted baby artichokes, aubergine and oven-dried tomatoes, sweet potato served with a chipotle chilli, red pepper and black bean salsa. Even the wines are vegan, organic, biodynamic and natural - made without animal fining agents like gelatine, chitosan or isinglass (made from fish bladders). The only shame of it would be to leave The Gate to the vegetarians. The third vegetarian restaurant from brothers Michael and Adrian Daniel, and their most central. One of the best vegetarian restaurants in London, The Gate has been making meat-free food fashionable since 1989. In 2016, brothers Michael and Adrian Daniel set up their third restaurant in London, and their most central, in Seymour Place. In keeping with their restaurants in Hammersmith and Islington, the menu includes favourites like aubergine teriyaki, and green banana fritters alongside new additions of three-way filled globe artichoke, aubergine schnitzel, and wild mushroom rotolo. Unlike the two established Gate restaurants, Seymour Place is open for breakfast serving scrambled tofu with smoky shiitake mushroom, toasted bagel with fresh avocado and organic poached eggs, and egg white and spinach omelette. In terms of style, the 86 seat restaurant - which has seating for 16 outside - is pared-back with plain walls and lots of natural light. The 'food to go' salad bar is the centrepiece at this Heddon Street restaurant. With interior designed by Tricia Guild and the expertise of Rolf and Marielle Hiltl, owners of the Hiltl Restaurant in Zurich, this vegetarian restaurant offers something a little special. This is the fifth such restaurant from Swiss brothers Daniel, Reto and Christian Frei who already run similar set-ups in Zurich, Winterthur, Berne and Basel. And a second London branch is at the giant Westfield shopping centre in Shepherds Bush. On entering this Heddon Street restaurant, the 'food to go' salad bar is the centrepiece, with large white bowls full of tempting salads made using quality, gluten-free ingredients like quinoa, millet and buckwheat. Alternatively, you can choose from a variety of hot dishes which cover a good range of cuisines from Asian and Indian to Mediterranean. With seating both inside and out, there's the option to eat in, al fresco or take away. Top-notch veggie restaurant in a charming space overlooking Neal's Yard. The Wild Food Café is a superb vegetarian restaurant offering an array of raw dishes, with daily changing options that include salads, sandwiches and main dishes. Options include the Wild Pizza, with a base made from dehydrated almond and butternut squash; the Wild Cult Sandwich, filled with cashew and coconut mozzarella and young coconut 'bacon'; and the Wild Masala Dosa, with Bombay-style sweet potatoes, hemp seeds and raw cultured chutneys. The desserts are a real highlight with raw chocolate, lemon and white chocolate tarts proving that pudding can taste devilish but be sin free. There's also a selection of fresh smoothies and juices, herbal teas and even organic beer, wine and cider. The dining room is huge, airy and overlooks the beautiful Neal's Yard, providing a quiet oasis in the centre of town. From cheap budget accommodation to luxury 5 star suites see our discounts for hotels, including Radisson Blu Edwardian Mercer Street from 70% off.